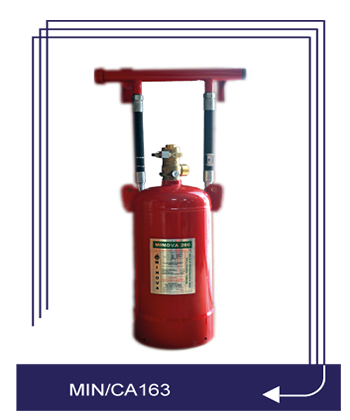 Heptafloropropane (HFC227EA) fire suppression agent is the first environmentally acceptable replacement for Halon 1301. It has zero ozone depleting potential a low global warming potential, and a short atmospheric lifetime. It is particularly useful where an environmentally acceptable agent is essential; where clean-up of other media present a problem, where weight versus suppression potential is factor, where an electrically non-conductive medium is needed, and where people compatibility is an overriding factor. Clean Agent can be used to protect a wide range of applications from sensitive electrical equipments to industrial application using flammable liquids. Consult the current NFPA Standard 2001 for specific applications. 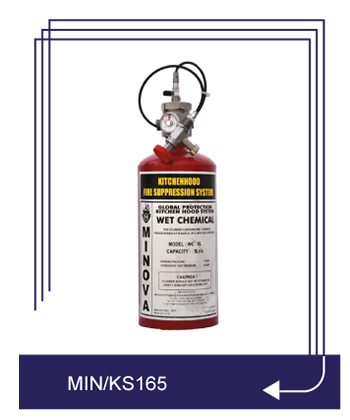 Clean Agent fire suppression agent is used with MINOVA total flooding Systems. Clean Agent is an odorless, colorless liquefied compressed gas. (See physical properties table for additional information). It is stored as a liquid and dispensed into the hazard as a colorless, electrically non-conductive vapor that is clear and does not obscure vision. It leaves no residue and has acceptable toxicity for use of occupied apace and design concentration. Clean Agent Extinguishes a fire by a combination of chemical and physical mechanisms. Clean Agent does not displace oxygen and therefore is safe for use in occupied spaces without fear of oxygen deprivation. Clean Agent is an effective fire extinguishing agent that can be used on many types of fire. It is effective for many surface fires, such as flammable liquids, and most solid combustible materials. On weight-of agent basis, clean agent is a very effective gaseous extinguishing agent. The Clean Agent extinguishing concentration for normal Class A combustibles is approximately 5.8 – 7% by volume. The minimum design concentration for total flood application should be in accordance with NFPA 2001. The toxicology of Clean Agent compares favorable with that Halon 1301. The LC50 of Clean agent is greater than 800,000 ppm which is equivalent to Halon 1301. Clean Agent has been evaluated for cardiac sensitization via test protocols approved by the United States Environmental Protection Agency. Test result shows that cardiac tolerance to Clean Agent is much higher than that of Halon 1301 and will be acceptable for safe use in occupied space protection. Clean Agent will decompose to form halogen acids when exposed to open flames. The formation of these acids is minimized by using MIMCO early warning detection systems and proper system installation. When properly applied and installed, the generation of these by-products by Clean Agent should be minimal. 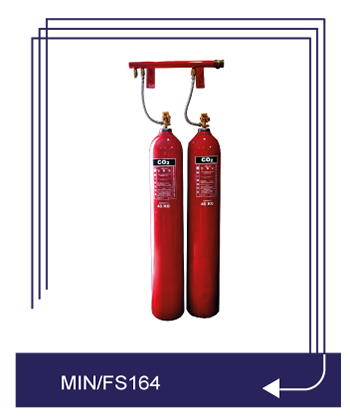 MINOVA Clean Agent Cylinders are used in fire Suppression system to store the Clean Agent until a fire develops and the agent must be released. The Clean Agent is retained in the container by a valve assembly which contains a fast acting rupture disc. The disc will be ruptured, and the Clean Agent released, through two methods: (1) Operation of an actuator by an electric signal that is automatically or manual controlled; (2) When the contained Clean Agent reaches an internal temperature range of 160oF to 187oF (71, 1oC to 86, 1oC), it will create sufficient internal pressure to burst the rupture disc and release the Clean Agent. The valve, which contains the rupture disc and actuator, is available in three sizes: 1” (25mm), 2 ½” (65mm) and 3” (80mm). The 1”(25mm) valve is used on the 20 (8 L), 60 (27 L), AND 100 (44 L) containers: the; 3”(80mm) valve is used on the 215 (87L). 375 (153L), 650 (267L) and 1000 pound (423L) cylinder. After a discharge, the valve is field reconditioned by simply replacing the three components. To eliminate the need of multiple cylinders, or using more Clean Agent than necessary, these cylinders can be filled in 1 pound (0.5 kg) increments to their maximum capacity. Each cylinder for MINOVA Clean Agent Systems is super pressurized with dry nitrogen to 360 psi (25 bars), at 70° F (21° C), to provide a quick and effective discharge in 10 seconds or less. MIMCO Clean Agent Cylinders are supplied with a pressure gauge that permits a quick visual inspection of cylinder pressure. Optional items included a Liquid Level Indicator, and a Low Pressure Supervisory Switch. The Liquid Level indicator provides the convenience of determining the containers agent weight without removing it from its installed location. The Low Pressure Supervisory Switch provides constant monitoring of the cylinders internal pressure. It is available in two days styles; normally opened and normally closed contacts. In the event of a decrease in container internal pressure from 360psi to 288 psi (24.8 bar to 18.8 bar), the Supervisory Switch normally opened/closed contacts will close/open. This will cause a supervisory trouble alarm at the system control panel MIMCO MINOVA Clean Agent. Cylinders are available for installation in the Vertical position. The mounting location of the cylinder is quite flexible. It can be mounted at the exact point of discharge or at a remote locating by adding distribution piping from the cylinder to the nozzle system. The operating temperature range is +32°F to +130°F (0°C to 54.5°C) in any installation. upon the amount of agent being supplied. The common manifold types are as follows. our Factory for advance configurations. A. Solid Substance Wood ,Paper,Rubber,Textiles etc.